No matter how you slice it, John has drawn the short straw. He has ALS. He was diagnosed 2 days after Christmas in 2007 and within a couple months his body was shutting down. By the time I met him (July, 2008) and photographed him for a story on assisted suicide he was unable to do anything except swallow and talk. Breathing was becoming difficult too. He, on the other hand, doesn’t see all this as the short straw. He has a belief system which supports life and the inevitable transition from one dimension of life to another… so there is really no problem. He is a little disappointed that his regular time has been cut short but has accepted the situation. Wow! I am impressed. Equally important is all the support he is getting from his family. I like the kids who helped make this photo more than fun than it could have been… In fact, the client asked me to return and photograph things a little more “serious” because he looked a little too good. John passed away May 21, 2009. He was 65. John Edward Peyton, Jr., 65, passed peacefully from this life on Thurs. May 21. He died in his home in Kent, with his wife Patricia by his side. John is remembered by those who knew him as a man who loved life and his family. These qualities were never more evident than in the last year of his life, during which he suffered the debilitating effects of ALS with peace, good humor, and a strong spirit. 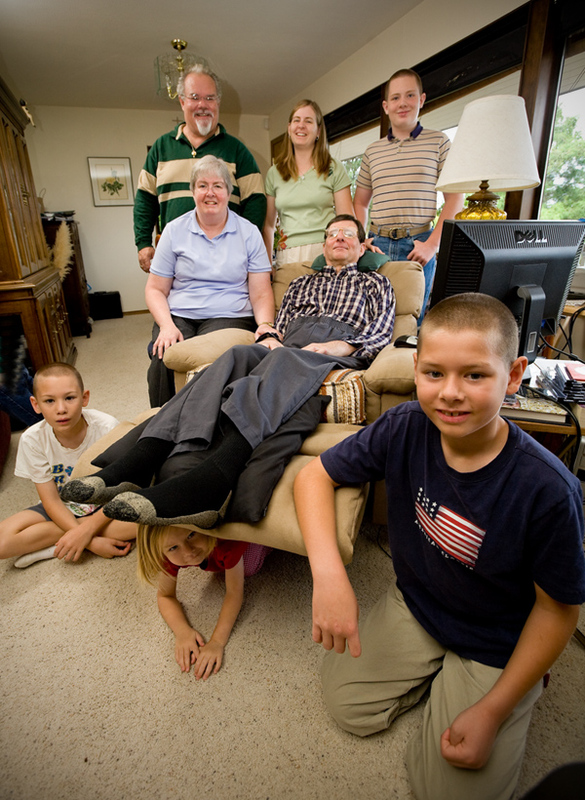 Up to the end of his life, he enjoyed a steady parade of visitors who came to lend support and fellowship to John and Patricia and inevitably left feeling inspired and encouraged. Those who now miss him greatly are comforted by his courageous and faithful example of living richly while dying. John is survived by his beloved wife Patricia, his dear sister Mary Jo Peyton of Modesto, CA and his 6 daughters, Anne Carriker, Theresa Decker, Colleen Archer, Barbara Berg, Valerie Thomas, and Regina Levy, their husbands, and his 20 grandchildren. This entry was posted on July 18, 2008 at 10:24 AM	and is filed under Photojournalism, Public Relations Photography. Tagged: Photojournalism, Public Relations Photography. You can follow any responses to this entry through the RSS 2.0 feed. You can leave a response, or trackback from your own site.